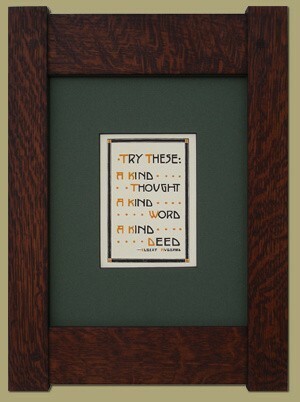 This motto is one of a series designed by Dard Hunter between 1905 and 1911 for the Roycrofters, and has been reprinted on the same hand press used by Hunter at his Mountain House Studio. We use only the finest handmade paper to ensure harmony with each print. 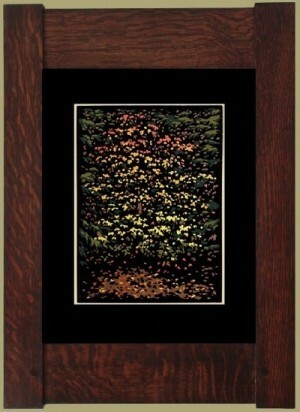 Shown here matted and framed in our Mortise & Tenon handmade quartersawn white oak frame. The print is available framed in our Mortise & Tenon or Oak Park style frames or matted only. The matted print is sized to fit an 8 x 10" frame. An elaborate design for a glass mosaic by Dard Hunter completed in 1908 while in Vienna features two stylized figures. There is no evidence that this design was ever executed. 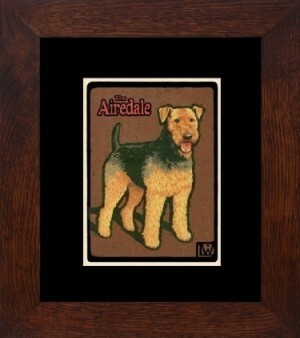 Shown here matted and framed in our Oak Park style frame. 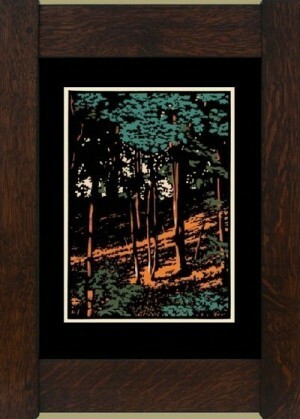 This offset printed print is available framed in either our Mortise & Tenon or Oak Park style frames or matted only. The matted print is sized to fit a 11 x 14" frame. 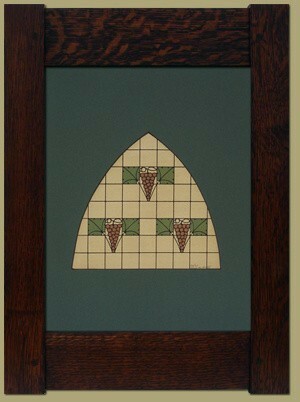 This pointed arch window design with grape motif is adapted from drawings and reproduced here in the original colors. 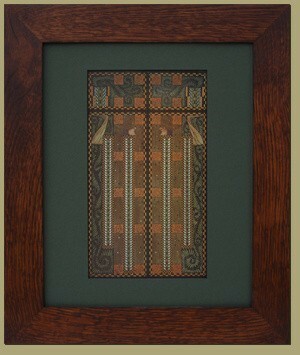 This window was originally produced by Dard Hunter for the Roycroft Inn in East Aurora, NY. Letterpress printed in three colors. 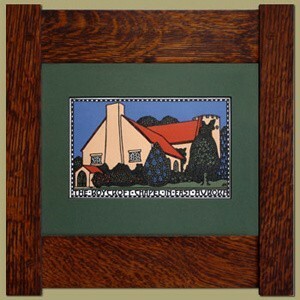 Shown here matted and framed in our Mortise & Tenon handmade quartersawn white oak frame. 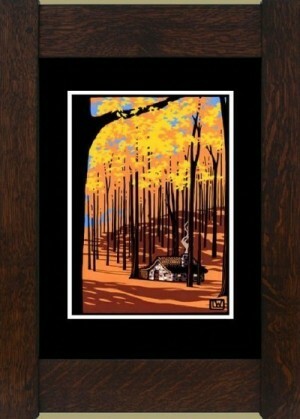 The print is available framed in either our Mortise & Tenon or Oak Park style frames or matted only. The matted print is sized to fit an 11 x 14" frame. 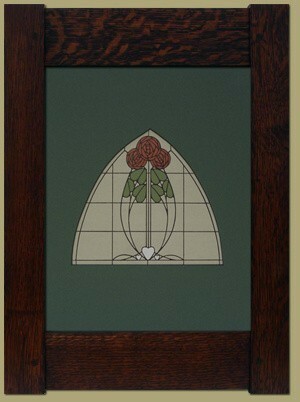 This pointed arch window design with a rose motif is adapted from drawings and reproduced here in the original colors. As far as we know, this design was never executed. Letterpress printed in three colors. Shown here matted and framed in our Mortise & Tenon handmade quartersawn white oak frame. 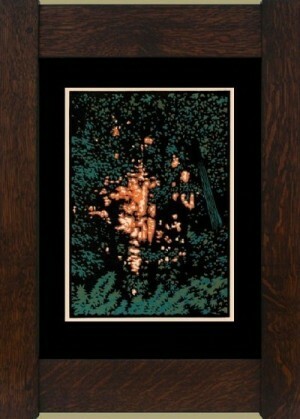 The print is available framed in either our Mortise & Tenon or Oak Park style frames or matted only. The matted print is sized to fit an 11 x 14" frame. The inspiration for this design is from an illustration by Walter Crane that appeared in the advertising section of Dekorative Vorbilder XXI. Letterpress printed in a sepia brown ink. Matted in Tartan Green to a size of 10" x 8" and framed in our quartersawn white oak. Overall dimensions 13.5" x 11.5"
This limited edition serigraph print is a reproduction of an original poster designed by Vojtech Pressig in 1919. 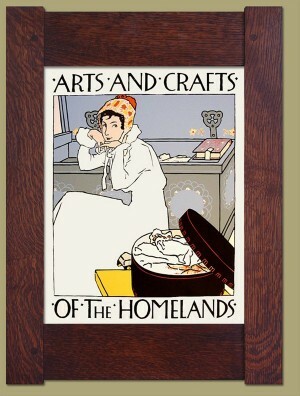 Our poster has been reproduced from an original given to Dard Hunter by Pressig in 1920. This hand screened serigraph is printed in six colors on Mohawk Superfine acid-free paper. Limited edition of 200. Image size is 20 x 24 and the sheet size is 24 x 30. Each print is hand numbered. Co-published by Dard Hunter Studios and P22 editions. Available framed or unframed. Print will ship loosely rolled in a heavy duty mailing tube. Designed by Dard Hunter in 1910 as part of a series of postcards highlighting scenic views of the Roycroft complex. Letterpress printed on handmade paper in five colors. 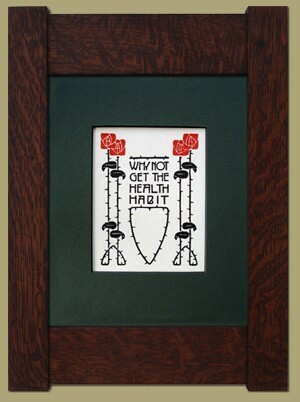 Matted to 8x10" and available unframed or framed in our Mortise & Tenon or Oak Park frame styles. Priced as shown here in our Mortise & Tenon frame. This pointed arch window design with a tulip & doves motif is adapted from drawings and reproduced here in the original colors. As far as we know, this design was never executed. Letterpress printed in three colors. Shown here matted and framed in our Mortise & Tenon handmade quartersawn white oak frame. 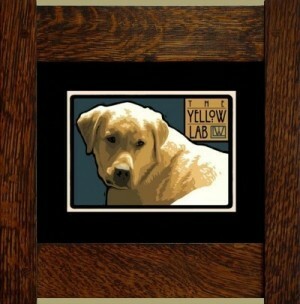 The print is available framed in either our Mortise & Tenon or Oak Park style frames or matted only. The matted print is sized to fit an 11 x 14" frame. 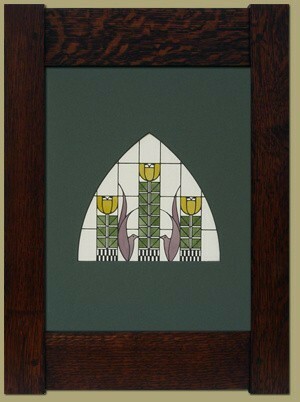 This window design with tulip and heart motif is adapted from drawings and reproduced here in the original colors. 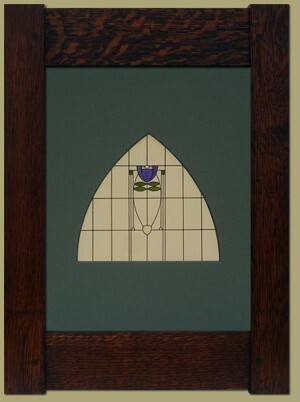 This window was originally produced by Dard Hunter for the Roycroft Inn in East Aurora, NY. Letterpress printed and hand tinted in three colors on handmade paper. 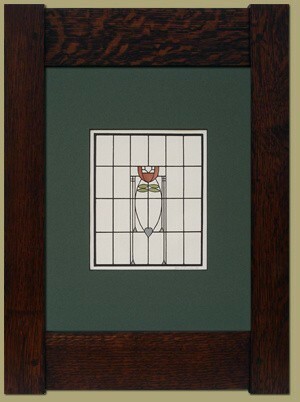 Shown here matted and framed in our Mortise & Tenon handmade quartersawn white oak frame. 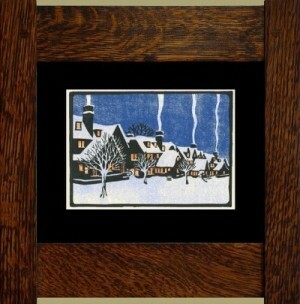 The print is available framed in either our Mortise & Tenon or Oak Park style frames or matted only. The matted print is sized to fit an 11 x 14" frame. Available for a limited time only. 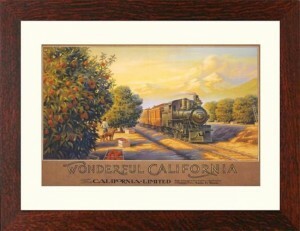 Wonderful California, a retro-style poster by Kerne Erickson, as shown here presented in a cream-colored archival mat and our "Oak Park" quarter sawn white oak frame. Image size is 13"x 9", with an overall dimension of 19.5" x 15.5" And, NEW FROM DARD HUNTER: Now select one of 3 color choices for our hand applied finish! All three look fantastic with this poster!